The all-time leader in sacks at the University of Tennessee, Derek Barnett is just another talented name in one of the deepest edge classes in recent NFL Draft history for 2017. 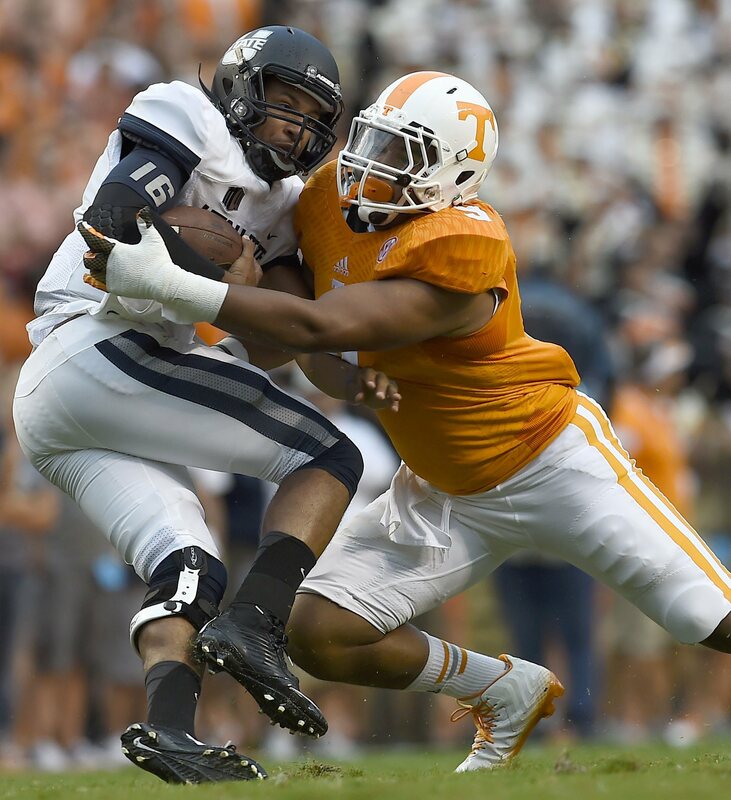 A three-year starter, Barnett was often the best player on the field for the Volunteers’ defense in 2016, totaling 16 sacks this season and 19 tackles for loss. While he may not excel in any one area as a pass rusher, Barnett is productive because of his all-around skill and strength. Particularly, his lower body is incredibly strong, allowing him to set up offensive tackles up the field before displaying his fast and often strong hands. As he captures the edge in the above clip, Barnett does a fantastic job not getting steered around the pocket, closing in on the quarterback and finishing. You’ll see more of this here against Kentucky, but when the left tackle gets his hands on him high, Barnett is still able to power through the block with a great center of gravity – again finishing at the quarterback with a big hit. Against guards, Barnett dominates off the line with incredible short-range burst and explosiveness, getting into the backfield with his quickness as well. This poor guard above from Florida can take some solace in the fact that this left guard from Texas A&M fared even worse against Barnett. 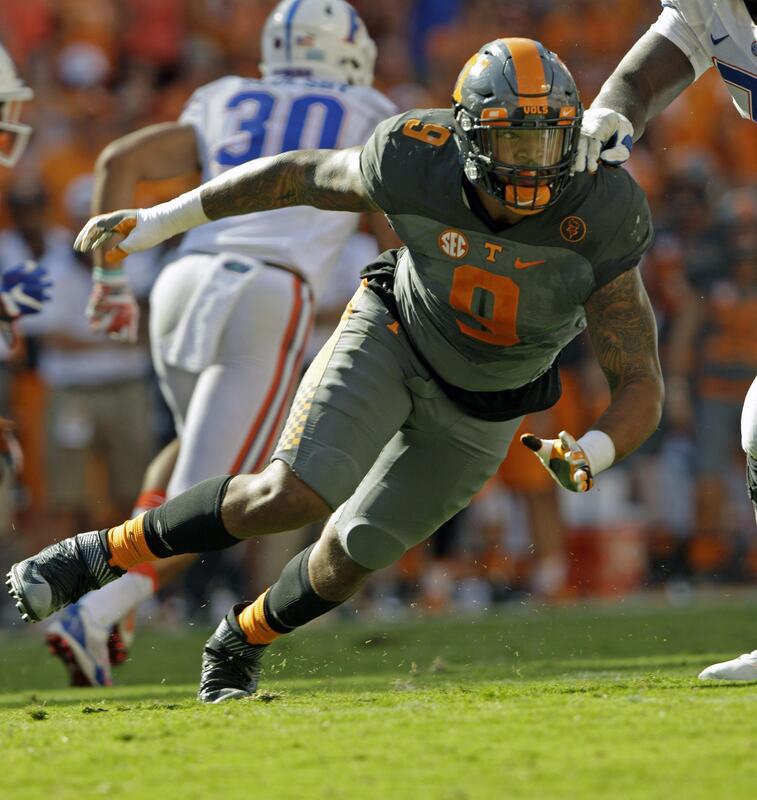 If Derek Barnett had the true bend displayed by prototypical right defensive end rushers in the NFL currently, there is no doubt his already high grade would skyrocket. While he still finds ways to win consistently, getting pushed around the pocket is still an issue more than it should be for him. Barnett will never get pushed up the field, but leaving plays like this around the quarterback is concerning to a certain extent. You can see that Barnett tries to snap back up the field to get the sack on this play, but the left tackle is able to get low and shield him away. As a pass rusher, Barnett’s counter moves are far from perfect, but certainly workable to add to his ability to finish plays. As a run defender, Barnett will get caught with his eyes in the wrong place at times, often recovering too high in his stance to rally to the ball. It is however important to remember that Tennessee’s defense as a whole struggled this season, so plays that got past the true pass rusher in Barnett often went for chunk plays that would be marginal gains at the next level. Once again, the production for Derek Barnett speaks volumes when it comes to analyzing what he does on film, but allowing the ball to get outside of him here is a bad look. The NFL Combine is going to be critical for Barnett, as the right schemes in the NFL can maximize his ability to set the edge against the run – assuming he has desirable length, speed, and other measurable traits. The 2017 class for EDGE talent is elite, and while Derek Barnett may not be, I have no doubt that he can be a productive NFL player. Capable of playing as both a weak and strong side defensive end, Barnett will only improve with NFL coaching in the few areas of weakness he displays. Derek Barnett’s raw strengths as a physical pass rusher with a high motor and some polished rush moves to pair with rare speed and power for his size make him a desirable first-round talent for the 2017 NFL Draft. Click here for my full 2017 NFL Draft Board, updated in real time as the draft process takes place!